From Andy Blankenbuehler, winner of the 2017 Tony Award® for Best Choreography for BANDSTAND and the 2016 Tony Award for Best Choreography for HAMILTON, comes the new musical that explodes with the most high-octane, heart-stopping and best dancing on stage today. 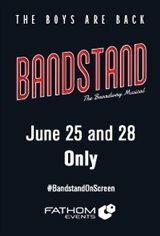 Presented by Fathom Events and Sing Out Louise, "The Boys Are Back: BANDSTAND, The Broadway Musical" comes to movie theaters nationwide on June 25 and 28 only, featuring exclusive, behind-the-scenes access with cast and crew. As America's soldiers come home from WWII, Private First Class Donny Novitski, singer and songwriter, returns to rebuild his life with only the shirt on his back and a dream in his heart.